Hot peppers, and tomatoes behind. They’re some of the last set of seedlings, a bit of an experiment to see how late I can start ’em without slowing down later growth in the field. Outdoors, it’s been warm, gray and drizzling for two days now, things are starting to emerge, crops and weeds both, and it’s already time for a second planting of spinach and mesclun. 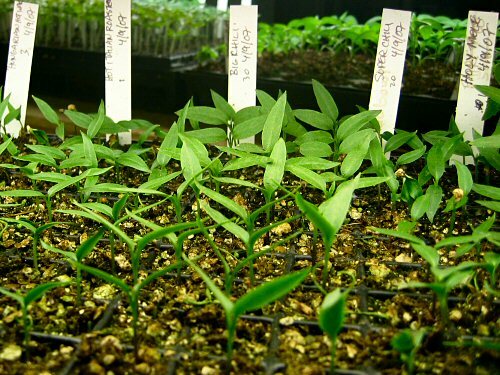 Inside, the last several hundred seedlings are ready to be potted up and moved out to the greenhouse. We’re right at the point when things suddenly start to get intensely busy! Tiny Farm Blog rocks – I love the way it’s everything I do but on a massive scale.